January 05, 2018 at 10:48 pm. KICKOFF: Saturday, 4:35 p.m. ET, Arrowhead Stadium. TV: ESPN/ABC, Sean McDonough, Jon Gruden, Lisa Salters (field reporter), Adam Schefter (field reporter). SERIES HISTORY: 52nd all-time meeting. Chiefs lead series, 29-22, including two wins in as many playoff meetings over the Oilers/Titans franchise. The first playoff meeting was in the 1962 AFL Championship, with the then-Dallas Texans topping the Houston Oilers 20-17 in overtime. The clubs met again in the 1993 AFC divisional playoffs, with Kansas City winning 28-20. The teams have split their last 10 games, the Titans pulling out a 19-17 win at Kansas City last season. The Titans have won four of the past five games at Arrowhead Stadium. KEYS TO THE GAME: The Titans have had issues running the football much of the season, but Kansas City has been vulnerable against the run, ranking near the bottom of the league. If the Titans can run, including getting Marcus Mariota involved, it should make play-action effective for chances downfield. DeMarco Murray will not play for the Titans. Kansas City leans on a high-powered offense, but the club’s wins have revolved around the defense and turning over the football. The Chiefs must contact Mariota and force him to beat them from the pocket, where Mariota often struggles with interceptions. If the Chiefs win the turnover battle and keep the Tennessee ground game in check, that should be all that quarterback Alex Smith and the offense need to pull off the club’s first home playoff win in 24 years. In their past few meetings against Smith, the Titans have been able to get the quarterback to make uncharacteristic turnovers. The Titans have to keep the Chiefs’ big-play trio of Tyreek Hill, Travis Kelce and Kareem Hunt in check. In Hill and Hunt, the Chiefs have more team speed than most of the teams the Titans have seen this year. –Chiefs TE Travis Kelce vs. Titans S Kevin Byard. Head coach Mike Mularkey hinted that the ball-hawking Byard could draw the assignment on Pro Bowl tight end Kelce at least some of the day. That is a tall order, but Byard has proven trustworthy and has shown a knack for big plays in bunches this season. –Titans RT Jack Conklin vs. Chiefs OLB Justin Houston. The Chiefs would love to get Houston on the edge terrorizing and chasing Marcus Mariota. Conklin, an All-Pro as a rookie, will have to be up to the test against one of the NFL’s best pass rushers. Houston led the Chiefs with 9.5 sacks and Conklin gave up only two. The Chiefs don’t necessarily need Houston to bring down Mariota to win, but they need Houston setting the edge to contain Mariota in the pocket and play a role in slowing down the Titans’ running game. –Chiefs WR Tyreek Hill vs. Titans CB Adoree’ Jackson. Hill recorded nine plays of more than 40 yards, including six touchdowns. Jackson led Tennessee with 17 passes broken up. Teams who leave Hill facing press coverage without safety help often find themselves chasing Hill from behind. The Chiefs thrive on deep balls to Hill. PLAYER SPOTLIGHT: Titans QB Marcus Mariota. Mariota did not have a good season statistically, throwing more interceptions (15) than touchdown passes (13). That can all be erased, however, with a strong playoff performance in Kansas City. This is his first playoff game, and quarterbacks are ultimately judged in the postseason. FAST FACTS: The Titans are in the playoffs for the first time since 2008. Tennessee tied for third in the AFC with 43 sacks. … The Titans were one of two teams in the NFL (New England) to have three players with five rushing TDs each — RB DeMarco Murray (6), RB Derrick Henry (5) and QB Marcus Mariota (5). … RB Derrick Henry led Tennessee with a career-high 744 rushing yards. He had three TDs of 65 yards or more from scrimmage, most in the NFL. … TE Delanie Walker led the team with 74 catches and 807 yards. He and Chiefs TE Travis Kelce are the only NFL tight ends with 800 receiving yards in each of the past four seasons. … LB Wesley Woodyard led Tennessee with a career-high 121 tackles and was one of two NFL players with at least 100 tackles and five sacks (5). … The Chiefs have won back-to-back division titles for the first time in franchise history. … Head coach Andy Reid has led Kansas City to the playoffs in three consecutive seasons. He has 11 postseason victories, second among coaches in the 2017 playoffs (Bill Belichick has 26). … QB Alex Smith led the NFL with a career-high 104.7 passer rating and was one of three QBs (Tom Brady and Drew Brees) with 4,000 yards (4,042) and fewer than 10 interceptions (5). He has 3,000 yards and fewer than 10 INTs in five consecutive seasons, the longest streak in NFL history. … RB Kareem Hunt led the NFL with a Chiefs rookie record 1,327 rushing yards. He led all rookies and ranked third in the NFL with 1,782 scrimmage yards. 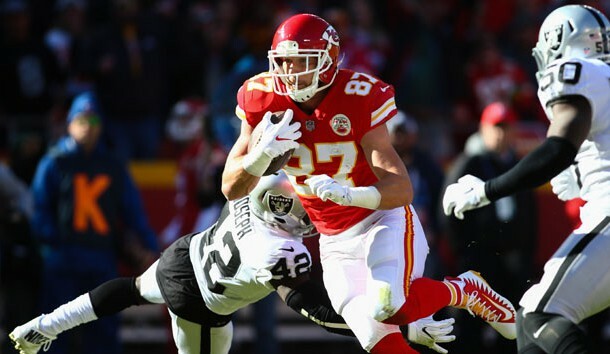 … TE Travis Kelce led all NFL tight ends with 83 catches and ranked second with 1,038 yards. He and Tony Gonzalez are the only players in Chiefs history with consecutive seasons of 80 catches and 1,000 yards. … WR/PR Tyreek Hill ranked fourth in the AFC with a career-high 1,183 receiving yards. He had six TDs of at least 50 yards TDs, most in the NFL. PREDICTION: The Chiefs are better than the Titans at the skill positions, and the veteran Alex Smith should have an arm up on the playoff rookie Marcus Mariota.